The interdisciplinary nature of the Erasmus Mundus Master's Programme Euroculture enables its graduates to work in a huge variety of sectors. A number of our students also choose to follow further studies, mostly on the doctorate level upon graduation. The Euroculture Consortium conducts regluar alumni surveys to examine the programms strengths and weaknesses. Within the last survey, several hundred graduates of the programme confirmed the good eployability of Euroculture graduates. The research shows that alumni of the programme have the background and skills to find employment in the relevant sectors and functions that the programme is aiming for. The survey shows for example, that more than 50% of the interviewed students found their first job within two months after graduation, and more then 75% found their first jobs within 6 months. It should be stressed, that almost a quarter of the respondents already found their first job during the programm, e.g. by continuing their internship placement. This underlines the programm's success to connect theory and practice, for example by offering the professional track in the third semester. Furthermore, the following charts demonstrate the variety of potential career opportunities. 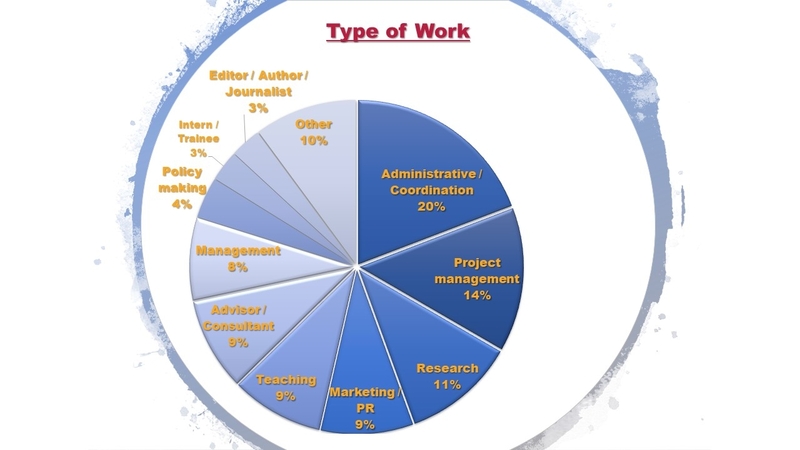 The majority of Euroculture alumni work in administrative, project management, research or marketing functions within all three, the private, public as well as the non-profit sector. A number of students have also undertaken further studies, mostly on the doctorate level. About 8% of all alumni followed PhD projects. The fields in which the alumni end up doing their PhD include History, Cultural & Literary Studies, European Studies, International Relations, Communication/Journalism, Law, Sociology, Education, Linguistics, Human Rights, Political Science, Health Care Management, Environmental Studies, Criminology, HRM and Public Affairs, which underlines the broad and multidisciplinary aspect of the Euroculture program. To find more information about our almunis, reports of experience, to get in contact with one of our many Euroculture Ambassadors worldwide or to explore possible internships, follow the links on the right.